Arab-Byzantine bronze imitating a bronze follis of Constans. With a countermark. This is a coin minted by the Arabs but based on the design of a coin of the Byzantine Emperor Constans who ruled from AD 641 to 668. It has to have been minted at or just after that time. Date : late 7th century AD. Size : 19.8 x 26.5 mm. Weight : 4.49 grams. 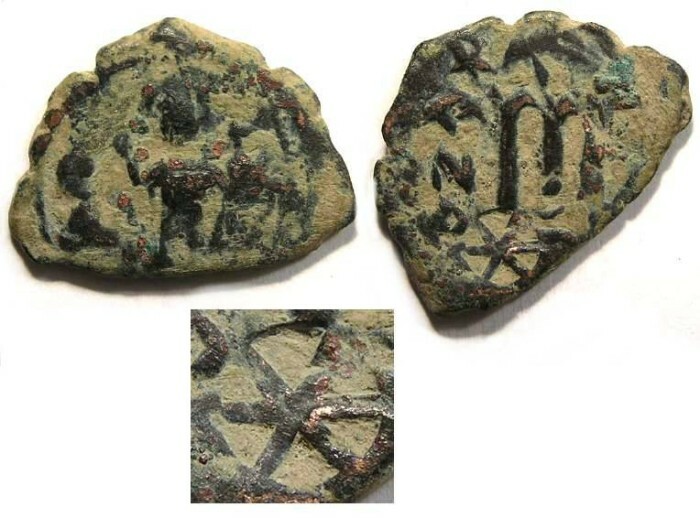 Reference : Similar to some illustrated in MI as #3 to 9 with the full standing figure of Constans holding a globus cruciger, and struck without mint name. Grade : Fine with a brown patination highlighted by earthy deposits. Obverse : Standing figure of Constans holding a Globus Cruciger. Reverse : A large but small case M with the word ANNO barbarised to the left, with a countermark of a six armed equilateral cross below.